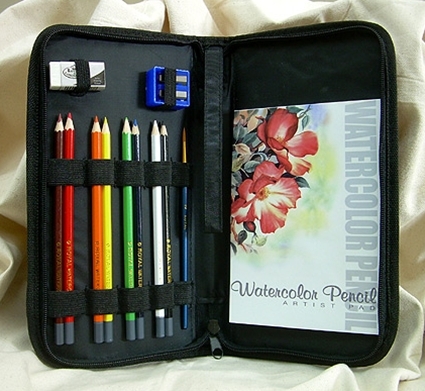 This convenient set includes eight watercolor pencils, a 5x7 inch watercolor paper pad (pad has six sheets of paper), one pointed nylon hair brush watercolor brush, one eraser, and one sharpener. Also included is a zip up case that is made out of sturdy, woven rip-stop nylon. The case has elastic sewn inside; so that your supplies will stay in place while you carry the case. 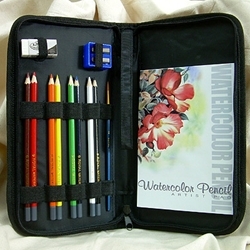 A great set for going out to draw en plein air, taking to class, or for travel. When zipped closed, the case measures approximately 10-3/4 x 5-1/2 x 1-3/8 inches.